While misalignment is common, many patients avoid care because of the look of traditional metal braces. For patients looking for straighter teeth, it is possible to receive orthodontic treatment without others noticing. At Signatures Smiles, we offer an aesthetically-minded solution to malocclusion that allows patients to confidently reach their dental goals: Invisalign® clear aligners. This orthodontic system enhances the appearance of a patient’s smile and improves dental function. At Signature Smiles, our team provides Invisalign clear braces as a reliable method to resolve mild-to-moderate alignment issues. 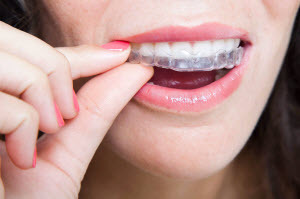 Virtually Invisible – Invisalign clear braces straighten teeth without the noticeable metal brackets or wires. Trays are made of translucent, high-quality plastic that snugly fit the contours of your teeth. This option works perfectly for patients with upcoming social events or important presentations. Removable Design -- When compared with traditional methods, clear aligners award patients with greater freedom. Those using Invisalign enjoy their favorite foods without dietary restrictions. Patients using Invisalign only need to rinse their trays in between meals and while performing their oral hygiene routine. Once approved, we take impressions and send them to the Invisalign lab. They then send back your predicted results and first set of trays. This helps you and our dentist ensure that this teeth straightening option is working properly as well as keeps you on track. Our Hixson dental team enjoys witnessing the transformation patients undergo after completing treatment with Invisalign. Our team provides these clear braces to adults so they may confidently achieve their ideal appearance and improve oral health. For more information about Invisalign, contact Signature Smiles today.